For my first Drink of the Week post of 2015, I thought I’d go back to my deepest cocktail roots. Long before I discovered the pleasures of a perfectly mixed Old Fashioned, I was an inveterate drinker of martinis, usually vodka martinis and always with olives. You see, I love olives quite a bit and while I didn’t love martinis right at first, I did love how I felt after I finished one and I really loved how the olives tasted after they’d been soaking in alcohol for a while. 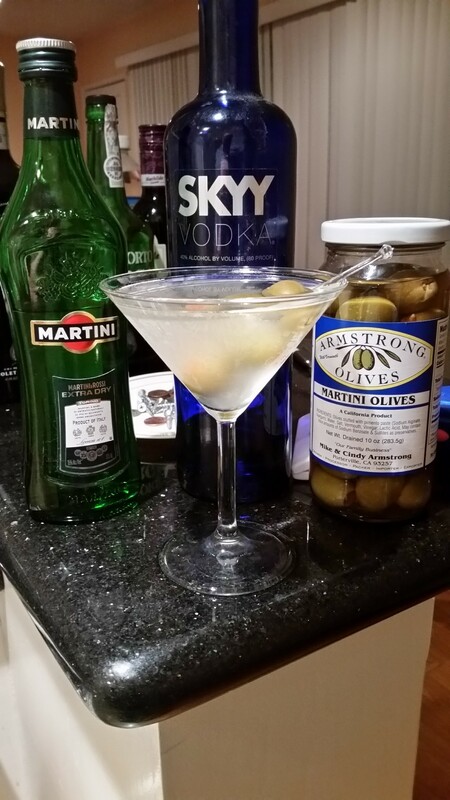 So, when I found out people were actually using olive brine in martinis, I was quick to jump on board the bandwagon. I was reminded of this when Drink of the Week manor was graced by the presence of an old and dear friend and her family. She makes probably the best Dirty Martini I’ve had and she helped me begin the process of perfecting my own recipe for a drink that deserves more respect from cocktail cognoscenti. I believe that my friend’s recipe is a state secret, but here’s mine. Combine all the liquid ingredients in a cocktail shaker with plenty of ice. Shake very vigorously, probably until your hands are freezing. Strain into chilled cocktail/martini glass. Add at least one olive. Toast the mighty and so underrated fruit of the olive tree; it is tasty and nutritious and where would Italian food be without it’s oil? Careful observers will note I’ve left out gin…and gin is often listed as a possible ingredient in a Dirty Martini. As an official cocktail snob since 2011, I generally now tend to prefer gin over vodka, which is essentially unflavored. However, the herbal flavors included in gins simply don’t blend very well with olive brine, which adds plenty of flavor of it’s own in any case. Also, I don’t really like to shake my gin martinis (sorry, 007!) but I ALWAYS shake my vodka martinis (Thank you, Mr. Bond!) — and the Dirty Martini demands to be shaken. Still, while vodka might not have the complexity of a gin or whiskey, that doesn’t mean all vodkas are the same. I mostly used a favorite old standby, Skyy Vodka and found the results predictably clean and crisp. I also tried 100 proof Smirnoff, which added a bit more alcoholic heat, but wasn’t bad, either. Still, what might matter the most in a Dirty Martini is your choice of olives and olive brines. I had great luck recently with both conventional, pimento-stuff martini olives from California’s Armstrong Olives, and BevMo’s jalapeno and garlic stuff olives, a gift from my old pal. In the past, I’ve used everything from sometimes surprisingly good supermarket brands to Trader Joe’s excellent cocktail olives from Greece (the ones that come in the larger bottle are more mellow and definitely superior). I will say that, for more salty brines, you might want to consider using less than a tablespoon. Also, unless you’re a complete expert in making these — and I’m not — you want to use precise measurements. I tried eyeballing this one at my friends’ house last Christmas Eve. The results were horrifically over-dirty. I’m surprised Booze Claus didn’t leave coal in my stocking the next morning.